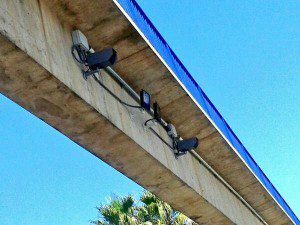 Update on the Motorway Malaga: A-7 versus AP-7. New radar in Mijas. Hello to you all who enjoy driving around our beautiful coast. In this blog we present a brief update on the installation of a new radar in the A-7 in Mijas, between Fuengirola and Marbella. Starting this Friday, June 28, a new radar will operate along the coast of Mijas, with a length of five kilometres in both directions. This stretch of the A-7 that runs through La Cala de Mijas is one of the black spots on the roads of Malaga. Its high traffic density and complicated route often cause accidents. For this section of the A-7 must be remembered that, because of its dangerousness, two years ago the maximum speed was limited to 80 kilometres per hour. If you exceed this limit, drivers can face fines ranging from 100 to 600 euros, depending on the severity, and loose between two and six points on their license. The existence of this new radar is expressly indicated with vertical signs, so that drivers are fully informed of the controls carried out, and adapt their velocity accordingly. Does this new information might tilt the balance in favour of the AP-7? What do you think? Fancy a new voting?